Michelle Obama Focuses On Work Still To Be Done Michelle Obama has pushed nutrition and exercise in her outreach as first lady, especially with children. But as President Obama campaigns for re-election, his wife speaks of unfinished business. 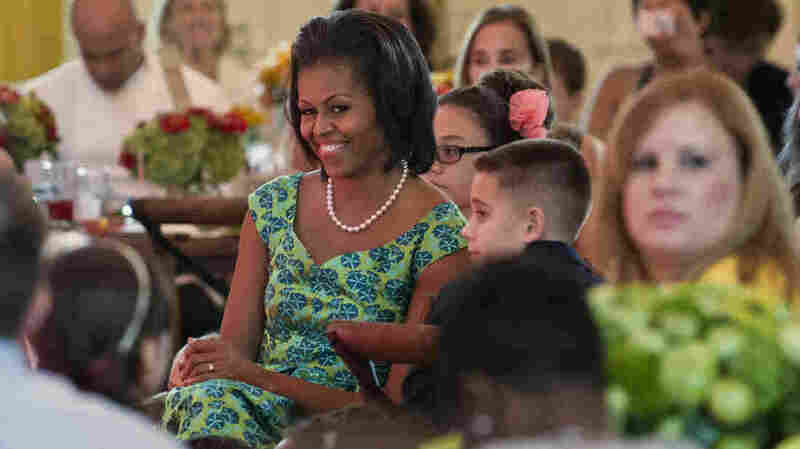 First lady Michelle Obama sits with guests as they eat lunch during a kids' state dinner at the White House on Monday. This week, first lady Michelle Obama was doing something she loves to do, talking about nutrition with kids. She hosted the first state dinner for children, welcoming 54 of them and their parents to the White House. "This is the hottest ticket at the White House, right here, because of all of you," Obama said to the children, who ranged in age from 8 to 12. The first lady stood before a colorful backdrop set up for the event in the East Room of the White House, with portraits of George and Martha Washington on either side. Dressed in a blue and green satin print dress, a simple strand of pearls around her neck, she spread her famously toned arms wide before joining in the applause and congratulating the tiny chefs — winners of a "healthy lunchtime" contest. "You came up with dishes that were packed with nutritious, delicious ingredients, dishes that are good for you, but more importantly, they taste good, too," she said. "See? It can happen. Healthy and tasty at the same time." While the kids started eating their "Yummy Cabbage Sloppy Joes" and "Quinoa, Black Bean and Corn Salad," the first lady introduced a surprise guest. "It looks spectacular," President Obama told the kids. "Hello, everybody." The president said he heard there was a state dinner going on. "Usually, I get invited to the state dinners," he joked. "So this time I just had to crash." The president praised his wife's "Let's Move" healthy eating and anti-obesity campaign, and the children's recipes. Then worked the room, going to each table and shaking the small hands of the junior chefs. Mrs. Obama often says that she and her husband, whom she actually met when she mentored him at a law firm, are partners and best friends who accessorize each other in many ways. Before he left the room, they exchanged a quick hug and kiss. 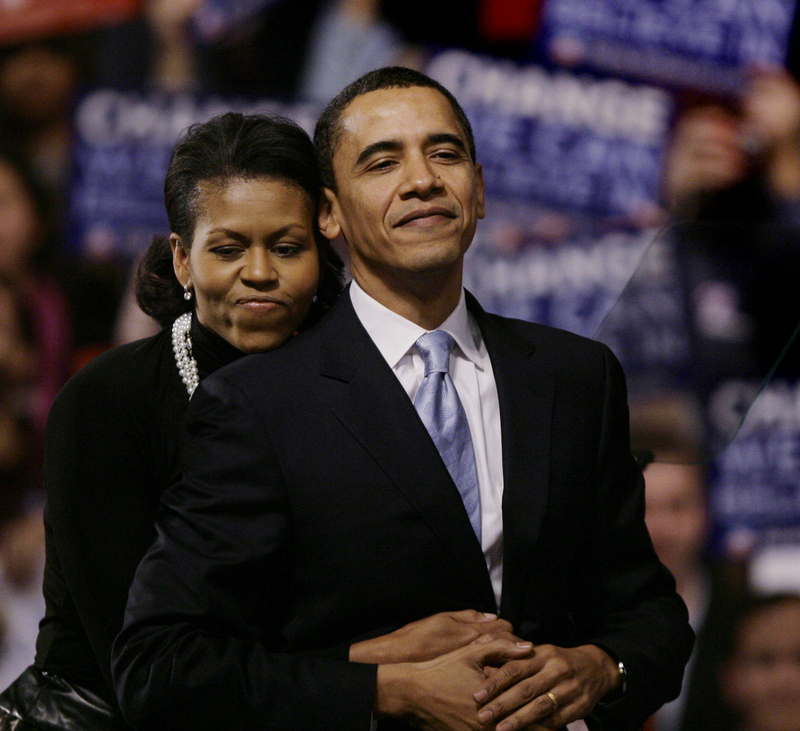 The Obamas' affection for each other is even more visible in an campaign video, as they describe their first date. Barack Obama wrote several years ago that he trusted his wife completely. He talked about that again recently during an interview on CBS TV. The Obamas on Jan. 8, 2008, at then-Sen. Barack Obama's primary night rally in Nashua, N.H.
"I am happily surprised at how I think this experience has strengthened rather than diminished our marriage," he said of being president. "I rely on her even more now than I did back then." Carl Sferrazza Anthony, a historian for the National First Ladies' Library, says Michelle Obama, like many first ladies, helped ground her husband. In her case, she helped her Hawaiian-born husband feel welcome in her hometown of Chicago. "It was really Michelle Obama's family and friends and neighbors and really a network, a support network, that helped root and plant Barack Obama and begin his political career," says Anthony. Jacky Grimshaw, a Chicago public policy expert, used to live next door to the Obamas on a quiet, tree-lined street of mansions. Grimshaw and other board members hired Michelle Obama as the first executive director of Public Allies, a leadership training group for young adults. Grimshaw says she was friendly, accessible, smart — and not much older than the people she was training. "Because these were young people — oftentime their first experience in the work world — they needed mentoring, they needed hand-holding, they needed an adviser," says Grimshaw. "And Michelle played all of that role, including supermom." That's the same role the first lady brings on the road with her these days, like earlier this spring when she talked about her own life during a speech at the Gary Comer Youth Center in Chicago. The facility, which helps young people graduate from high school and go on to college, is located not far from where a young Michelle Obama lived. "I grew up just like you. Same background," she told the crowd. "My family didn't have a lot of money growing up. Neither of my parents had the opportunity to go to college, and most of the folks in my neighborhood didn't get a chance to go either." The first lady said hard work and focus allowed her to graduate from Princeton University and Harvard Law school. She became an accomplished attorney and put her career as a hospital executive on hold for the 2008 campaign. At that time, her husband's opponents often called her angry. She made a mistake of saying that she felt proud of the country for "the first time" in her life because she felt hope was finally making a comeback. Stephanie Cutter, a former chief of staff to the first lady, was brought onboard to help quell that controversy. Cutter, now deputy campaign manager for President Obama's re-election bid, says many people can relate to the first lady, because her life story is a familiar one for many Americans. "Her parents worked hard to ensure that [she and her brother] got opportunities that they didn't have," says Cutter. "That her father struggled with an illness [multiple sclerosis], but got up and went to work every day." She's also known for her devotion to the Obamas' two daughters, Sasha and Malia. As first lady, she has traveled the country on behalf of the U.S., appearing at the Olympics and visiting and helping military service members and their families, which is one of her primary initiatives. She's also been a guest on The Tonight Show and talk shows like The View, where she's able to show off her sense of humor. Most important for the White House, though, is that the first lady is a potent campaign spokesperson. Confident and standing tall at 5 feet 11 inches, Mrs. Obama presses her husband's causes and accomplishments. "For the past 27 straight months, we have actually been gaining private sector jobs," Obama told a Colorado high school audience in June. Mrs. Obama rarely makes mention of her status in American history as the first African-American to become first lady, but during an address at a conference of the African Methodist Episcopal Church, she spoke about the gains of black Americans. "Today while there are no more 'whites only' signs keeping us out, no one barring our children from the schoolhouse door, we know our journey is far from finished," she said. That theme of unfinished business is one the first lady also makes on the campaign trail as she works to help her husband gain four more years in the White House.